According to research compiled by The National Retail Federation, Americans spent $2,020,000,000 last year on just Halloween decorations – an amount that does not include money spent on costumes or candy. This year it is predicted that consumers will spend even more. That’s a lot of orange lights and plastic skeletons! 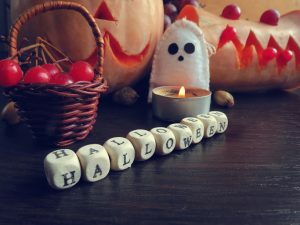 Fortunately there are plenty of ways you can get into the Halloween spirit without shelling out a spooky amount of cash. Below are some terrific DIY Halloween decoration ideas that cost very little to make. Recreate these decorations yourself, or get inspired to come up with your own designs. These 10 DIY Halloween decorations cost very little to make. Recreate them yourself, or get inspired to come up with your own ideas! Lolly Pop Ghosts This is such a simple and fun craft idea that you can do with your children. A box of tissues, a bag of lollipops, some elastics and ribbons and a marker are all you need to make a fun flock of ghosts. These make great party favors too. Spell Books Repurpose your old books into spooky spell books. Decorate the shelves in your home with books that have been made to look extra creepy with decoupage glue, paper towels, and black paint. Packing Tape and Trash Bag Ghost Create a translucent ghost using packing tape and a trash bag. Try making this female ghost or one of these other ethereal forms. Packing tape ghosts make an eerie and eye-catching focal point for a party room or covered outdoor area. Trash Bag Spider Web Transform black garbage bags into dramatic giant spider webs. It’s inexpensive, easy and fun! View the video for a step-by-step tutorial. Head in a Jar Have photo editing software? Using some basic editing skills and a laminated photo of yourself, you can scare your Halloween guests by putting your “head in a jar.” Place the pickled head on a shelf, in the fridge or cooler, or anywhere you want to provoke a big reaction. Don’t have photo editing software? Just put a mask in a jar. Bloody Handprint Clings Add bloody handprints to mirrors, windows, floors and shower doors and give your home a gruesome crime scene look. These reusable clings are easy to make with glue, food coloring and some other supplies you probably already have around the house. Tomato Cage Ghosts Take the tomato cages out of your storage and turn them into fun Halloween decorations. Wrap an upside-down tomato cage in white lights, throw a sheet over it, glue on some eyes, and in minutes you’ll have a cute ghost. Here are some other great Halloween décor ideas made with tomato cages. Cheesecloth Ghosts Craft gauzy ghosts out of cheesecloth that has been starched stiff. Make ghosts for a table display, hang them from the ceiling, or create incredible life-size ghosts for outdoor displays. Spooky Silhouettes Dress up your windows with silhouettes made with sheet foam and black paint. Use the ghost cut guide included in the directions or come up with your own ghoulish ideas. Want to take it up a notch? Turn your entire home into a luminary with these truly outstanding and artistic Halloween silhouettes created with inexpensive black paper. Yarn Pumpkins Add a patch of pretty pumpkins to a windowsill, dining table or mantle. These pumpkins are created with balloons, glue and yarn and look like something you might find in a boutique – except you can make them for practically nothing!